ASOP No. 31, Documentation in Health Benefit Plan Ratemaking, has been repealed by the ASB. ASOP No. 31, Documentation in Health Benefit Plan Ratemaking, was effective in 1998 and relied heavily on Interpretative Opinion No. 3 of the Guides and Interpretative Opinions as to Professional Conduct of the American Academy of Actuaries. In 2002, the ASB repealed Interpretative Opinion 3: Professional Communications of Actuaries when the Board adopted ASOP No. 41, Actuarial Communications, which supersedes the guidance of Interpretative Opinion No. 3. ASOP No. 41 is applicable to all areas of actuarial practice and provides guidance with respect to written, electronic, or oral communications. The Health Committee of the ASB has reviewed ASOP No. 31 and compared its guidance to ASOP No. 41 and other ASOPs. The committee concluded that the guidance in ASOP No. 31 is addressed in ASOP No. 41 and other ASOPs. The exposure draft of this repeal document was issued in September 2008 with a comment deadline of December 31, 2008. Four comment letters were received. For a summary of the substantive issues and the reviewers’ responses, please see Appendix 2. The Actuarial Standards Board wishes to thank all who commented on the repeal. The ASB voted in June 2009 to repeal ASOP No.31. ASOP No. 31 is repealed for any work performed after June 30, 2009. Note: This Appendix is prepared for informational purposes only. 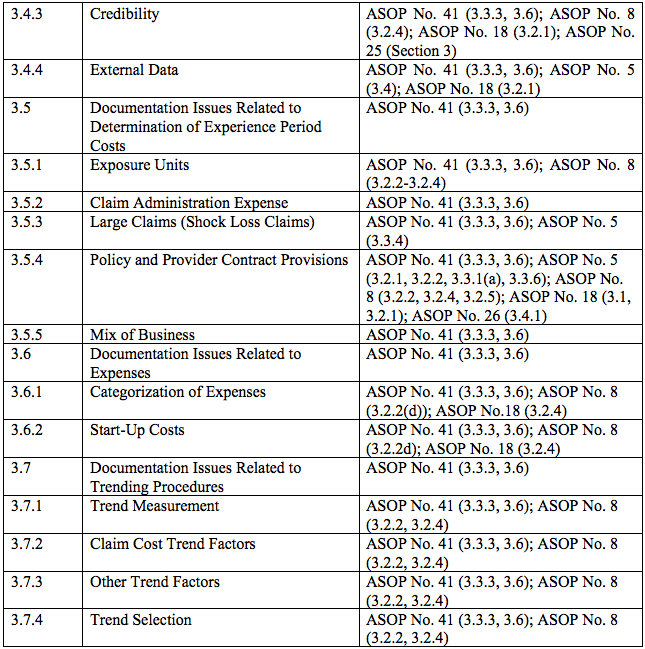 The Health Committee prepared the following grid, which identifies provisions of section 3 of ASOP No. 31 cross referenced against ASOP No. 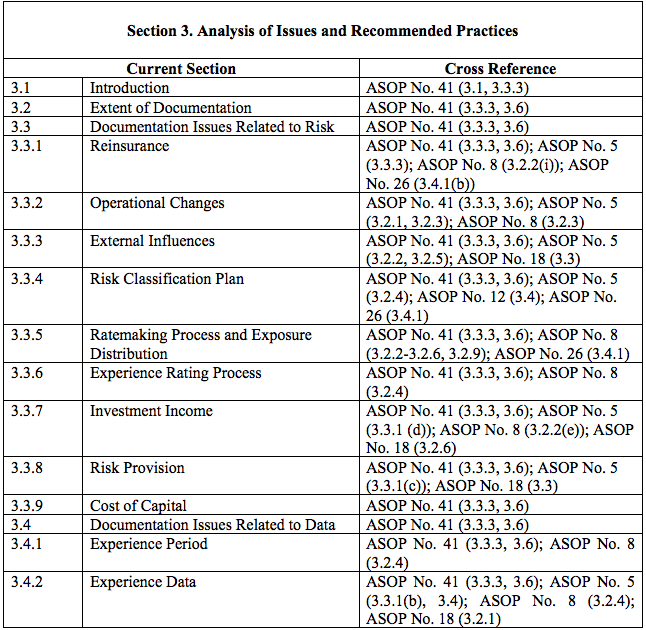 41, Actuarial Communications, and other ASOPs to reflect where pertinent actuarial guidance already exists. The exposure draft of the repeal of ASOP No. 31, Documentation in Health Benefit Plan Ratemaking, was issued to the membership in September 2008 with a comment deadline of December 31, 2008. Four comment letters were received. The ASB and Health Committee carefully considered all comments received. Summarized below are the significant issues and questions contained in the comments and responses to each. The term “reviewers” in Appendix 2 includes the Health Committee and the ASB.